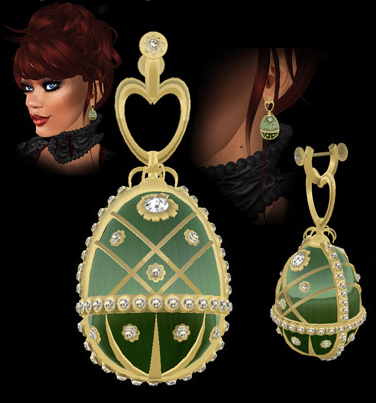 The creator of these amazing Eggs is Alastair Whybrow owner of a little jewellrey store called “Sparkle of Sound”. “Sparkle of Sound” is specialized in victorian jewellry but can of course be worn by anyone with love to something more exclusive than mass jewellrey. Especially those with a weakness for tiaras will find lots of fine tiny prim crafted items there. 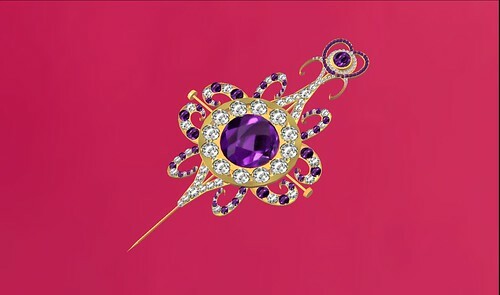 These fabulous Earings can either be bought by themselves for 450 Linden or bought in a complete set which includes a tiara, the earings, a necklace, bracelets and a bird ring for 2500 Linden. Seems much but is worth it. Outside the shop is a vendor where I found this lovely brooch. All money made through these vendors goes directly to “Relay for Life” – the American Cancer Society. Hey, buying a lovely brooch and doing a really good deed at the same time doesn’t sound too bad or? Everyone should have 250 Linden to spare. ← Visiting the Greenies in Second Life!